I’ve been holding back on writing this. I don’t want to sound like a whiner, and I’m not an attorney. But I feel strongly about this issue and I want to say some things about it. That’s what blogs are for, right? So here goes. First, some background. I consider myself to be a writer/blogger first and a photographer second. When I started my blog in June 2010, I didn’t include photos in my posts. A month or two later I started posting point-and-shoot snaps, and a couple of months after that I introduced DSLR photography. The issue of copyright infringement didn’t occur to me back then, because it didn’t occur to me that anyone else would want to use my photos. Gradually, photography began to play a larger role on my blog. I ventured into interesting parts of Joburg and took photos of things that caught people’s attention. I started receiving requests from people who wanted to use my content — both photos and text — for free. I was flattered at first and often agreed, even though I felt a little uncomfortable about it. At some point along the line, I read a blog post about copyright infringement and decided I should protect my work. I created a copyright page for my blog and placed a prominent link to it at the top of my website. The copyright page states that anyone who wants to use my photos must ask me first. 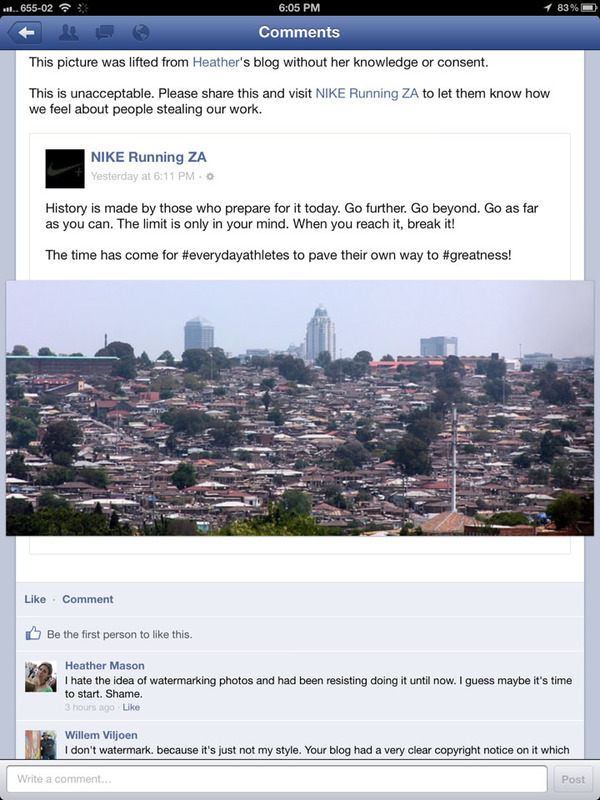 In September 2012, I stumbled onto the Nike Running ZA Facebook page and found one of my photos there, without credit or consent. Some of you might remember the post I wrote about that. My photo on the Nike Facebook page. Nike eventually compensated me for the photo after my blog post caused a small ruckus. After that incident, I began discovering my photos all over the place. The culprits include international corporations, grass-roots organizations, government agencies, tour operators, glossy magazines, travel blogs and everything in between. And these are only the instances that I’ve discovered. My photos have been used dozens, probably hundreds, of times without my knowing. In some cases, I believe the copyright infringement happens because the perpetrator is ignorant and doesn’t know better. In other cases it is blatant, mindful theft. After years of resistance, I began watermarking my photos about four months ago. I don’t like the way watermarks look, but I hope that little “© 2Summers.net” reminder will deter at least some people from using my photos without asking. Still, I don’t have time to go back and watermark every photo that I’ve ever posted on my blog. (There are thousands.) And a watermark won’t necessarily prevent theft. But anyway, my photos aren’t free. Here are several reasons why. 1) My photos aren’t free just because they are on Google Images. 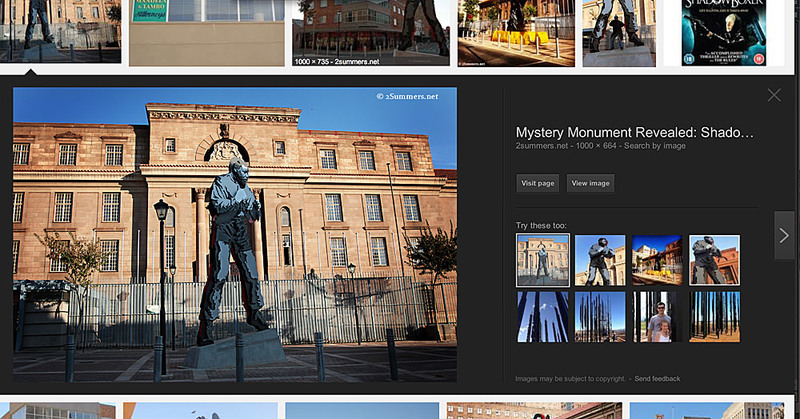 One of my photos on Google Images. Many people use Google Images as a free photo archive. However, this is not the intended purpose of Google Images. 2) My photos aren’t free just because they appear on a blog, or because they are “on the internet”. Believe it or not I have heard this justification more than once. Some people think that any photo appearing on the internet is free. This is ridiculous. Yes, I am a blogger and yes, I post images on my blog. I publish my blog free of charge — no one pays me for it. But just because I am blogging “for free” does not mean that the photos on my blog are free for you to use. 3) My photos aren’t free just because you’ve credited me. This is a common misconception, especially among bloggers. Many bloggers seem to believe that they can use other bloggers’ photos without asking, as long as they provide a credit and link back to the other person’s blog. Wrong. I don’t give my photos away to other blogs without carefully considering the pros and cons of doing so. That’s why my copyright page says: “Please do not use anything from this blog — text, photos, or anything else — without asking me first.” Simple. 4) My photos aren’t free just because other photographers provide photos for free. There are many amateur photographers who consider photography to be a hobby, not a livelihood, and are happy to let others use their photos for free. I have no problem with that. But don’t expect me to do the same. My photos aren’t free. 5) My photos aren’t free just because your website/magazine/book will provide me with great “exposure”. 6) My photos aren’t free just because your intern/designer/editor downloaded them and you had no idea where they came from. You need to do a better job managing your staff. Not good enough. 7) My photos aren’t free just because you don’t have the budget to pay for them. …I could go on but you get the idea. My photos aren’t free. However, reading and sharing this blog post is. Please do so, and please remember it the next time you right-click on a photo from “the internet”. Absolutely! It would make me sick to think what I could have made had folks actually bought those images. You’re right to be angry. You’re right to write about it! Thanks Kathy! Hope you’re well. You are absolutely right to defend your rights ! Thanks Catherine, I appreciate that. Great post! I’ve always watermarked my photos and I think it’s prevented theft. I know of only one case where someone took my photo without asking me and I had it removed from FB. There could be more of my photos out there and I’m unaware of it – how did you find your stolen photos on the net? Most of the incidents I’ve discovered have been completely by chance. Like I’m flipping through a magazine and suddenly stumble on one of my own photos. Or I go to a Facebook page to check out an event and discover my photo is the cover pic for the event. In the case of the Africa Is a Country post, I actually saw in my blog stats that I had a referral from that page. When I clicked on the link I found my photo there (with a hyperlinked credit). I think there is a way to do more comprehensive searches to find out where your photos appear on the internet. But I’ve never done it. I guess I should figure that out. Haha. So true! I do use images found on the net, but only if there is a Creative Commons license in place, or if I receive express consent from the content creators. While I do refer to other writers works (blogs, articles, etc. ), I only mention them while providing the link. If I use actual quotes from their work, I get permission. Each person has explicit rights to their work, whether audio, visual, or written, and therefore has the right to determine how it is used. So I empathize with the way you feel! Sounds like you’re doing things the right way. It’s actually not that hard! Thanks for the comment. Yes, good rant Heather, fully justified. It’s time people remembered their manners. I agree that it is highly annoying. I commonly need photos for some of my social good posts and usually end up using the ones found in the Wikipedia free commons images even thought they aren’t the best I know that they can be used. Yes there are millions of images out there on the web when you google search but it always has the copyright info and it isn’t hard to miss. Wish there was a better way to control image and writing theft but I don’t know of any yet. Yes, very frustrating and no easy answers. Thanks for the comment, Nicole. agree 100% ! same applies to any creative output. Agreed. Same issue definitely applies to writing and everything else. I just ran out of time to discuss it all. I know I used to feel the same. But I actually don’t mind it so much now. It’s a necessary evil. Do yourself a favour and put a C symbol with the date and your name on all photos you publish. Like this you will be protected from copyright infringement. No lawyer required. I do think the watermark helps, although people can easily crop them out or just use the pic anyway with the watermark on it. But I agree, it’s the easiest and best thing to do to avoid blatant theft. Amen, this is a really annoying phenomenon. It was particularly annoying when I’ve had large news corporations ask me to give photos for free, who found me because they couldn’t find suitable images on a stock photography site, and then argue with me that they can’t pay because they found it on Flickr. Yes, I’ve noticed that with Fickr too. I actually stopped using it — seems like too much work for too little payoff. As you are aware, I once was guilty of stealing from you, but never again. It’s the same story with writing. People somehow think it’s okay to ask you to write or edit something for free. Tsk, tsk. Indeed. Maybe someday the work will wise up to the fact that creative work is still work. I feel like this is a very gray area and I’ve been guilty of using images on my blog without linking when I first started blogging. Now I always make sure to post a link back to the original source if I do use a picture that wasn’t taken by me. I don’t have a copyright page on my blog, though I probably should. Many bloggers (like myself!) are unaware of these kinds of things so I feel your post should be shared to educate others. I think the general consensus is that most people don’t feel like contacting others to ask for permission (or are just unaware that they should or don’t see why they should bother). Google Images has kind of created this culture where everyone thinks all the images there are intended for public domain–despite the disclaimers you pointed out, most people do gloss over them (and I know, because I’ve done it! Not that I’m proud of it). I will definitely try to be more careful about the images I use in my posts, but I feel this will always remain a murky area for a lot of people. Yes, posting someone’s image with a credit and link, but without asking, is definitely still wrong. In the case of the Africa Is a Country post, the article espoused a point of view that I seriously disagree with. Compensation and copyright issues aside, I just didn’t want my name associated with that article. Just one of the reasons why I insist that people always ask me before using a pic. I totally agree. I always try to remember ask permission to reblog a post. It is your creation. Right. Thank for the comment! Excellent post Heather! So many people don’t understand the issue of copyright, especially when it comes to online work. I was really annoyed with a blog that copied my entire post word for word without even asking! Glad I asked your permission before I reblogged your pics though 🙂 Can’t wait for our PE trip! Yes, I didn’t have time to get into this in my post but the issue relates to writing (and all creative content) in addition to photography. I can’t wait either! Good for you. It’s a request for respect and exchange of information that belongs to the professional that needs to be appropriately remunerated. It’s like piracy, needs to be shouted from the roof tops. Pay the people who do the actual work or do it yourself! Haha Sheryl, I knew you’d like this post. Hope you can open this. Great article Drury, thanks for sharing. Just read the article now. Right on. This has been a headache for photographers since the internet was invented. It’s the same with writing and blogs. We can copyright, but that doesn’t stop everyone from grabbing pictures of your grandkids and using them to sell stuff, or posting your words as their own. Although the copyright marks are a good step, it doesn’t always stop people from taking stuff if they think it’ll be too much trouble for you to go after them — and unfortunately, it usually is. I’ve read dozens of blogs from professional photographers who’ve been ripped off and found that taking it to court turned out to be a years-long nightmare. There must be some simple way that photos (and blogs) could be locked so that only the originator can copy or share them. “If you don’t want them shared, don’t post them anywhere” is just twentieth-century thinking. Why haven’t any of the new geeks come up with something? BTW, people tell me all the time to go to Google Images rather than ‘Dreamstime’ because they assume Google’s free, as in free to help yourself. But what bothers me more than using something without permission, although crediting, is claiming or implying that it’s yours. Happens all the time. My writer friends routinely Google excerpts from their books to see if it comes up under someone else’s name. It doesn’t happen often, but it has happened. There is apparently a way to protect your photos so that people can’t right-click and download them. I haven’t gotten around to figuring out how it works though. I’m not sure the option is available on WordPress.com sites, only wordpress.org. That’s not really a solution. A determined person would just make a screenshot of the website or save as PDF and crop. I feel your pain, I spent some time chasing up people who used my flickr photos without asking (I use CC license, but ask for notification). But you can spend your life doing this for very little result. I have to say though, that the issue is not just the Internet making it easy to collect other people’ sword, but the fact that so many more people now are publishers. Not being professionals, they don’t understand copyright law. I think you will find that many more people understand that they can’t just copy text wholesale, because we were all taught to credit quotes in school essays. Photography is different. I think there is a lot of ignorance. I don’t have a solution, but just like the piracy and downloading issue I can’t see that locking down our work is going to make a difference. It’s all a bit of a mess, really. Very true, Fiver. I do agree that photo theft seems to be more rampant than writing theft. People just don’t get it. I’m sorry to hear that you’ve been holding back, and I’m glad you finally said something. This is part of the reason why I don’t like to use stock footage or photos, I have no idea unless it is under Creative Commons. And I don’t watermark my photos either. It’s too much work and I’m not into that. As a fellow blogger, I’m paranoid of finding my ideas used on other sites about Thailand. I found the exact title of a blog post on a more popular site (along with other things) but this is small stuff and probably an innocent mistake. I say this though, because who is to stop someone from visiting your site and culling ideas from there? Thanks for posting. I hope folks will ask you and others before they use your work. Yes, it’s all very murky and frustrating. I used to have the same attitude about watermarking but felt I had to give in when my photos started showing up in printed magazines without my consent. And yes, it’s hard to distinguish between honest mistakes and conscious theft. All that said, I do feel that as bloggers we take certain risks with our international property and have to be prepared to get our stuff stolen. Doesn’t make it any less annoying though. Hey. You had a rockin’ and rollin’ McDonald’s video ad at the bottom of your blog when I read it on my ipad this morning. Doesn’t seem to be there any more. At least it’s not on my computer version. Haha Dad, I thought your comment would be some kind of profound or funny anecdote about photo copyrighting. Instead it is about the McDonalds ad at the bottom of my blog. I have no control over those ads – one of the disadvantages of using a free WordPress host for my blog. Excellent post Heather. I keep wanting to drop you a line – I especially adore Smokey – but never seem to get round to it, although I’ve been reading your posts forever. I’m glad you brought this up. I’ve seen my illustrations all over the place, and just a few weeks ago, someone (no names mentioned, suffice to say it was a fairly big media person who should know better) told me that my work on their blog was excellent exposure for me, the implication being that I should be more grateful. Ha! Money first, exposure after, thank you very much. Also, I understand the watermark issue so well, and have tried to avoid it for years now, but maybe it is the best way to go. Thanks Mellissa, I appreciate the comment. It’s a tricky thing…There have been times, especially early on in my blogging career, when I did give content away for free for the ‘exposure’, and it actually paid off. But of course once I do that it sets a precedent, both for me and others trying to make a living off their writing/photography/art or whatever. I wish I had an easy answer. Anyway, your drawings are beautiful. Best of luck and thanks for reading. I haven’t even begun thinking about copyright infringement for my own photos because I consider myself an amateur blogger and photographer, and honestly don’t know what I’m doing, but I like the way in this blog post you express how your photos aren’t real. If ever I choose to begin copyrighting my own photos, I will be looking back to this post. I also don’t post my photos at very high resolution, although I do make them large enough (about 1000 pixels wide usually) that they look sharp on the screen. But you’d be surprised what people will do with low res images. If the pic is large enough to look good on your blog then it’s large enough to look nice on any other website too. Anyway, thanks again and good luck with your blog! It’s amazing what people will do. Best of luck with yours, as well! How frustrating!! Good on you for writing this post. But it does certainly make me think about using other people’s photos in my posts (even when I do link back to them) – thanks for the reminder (and there are very prominent bloggers who do this on a daily basis – pretty sure they haven’t asked for permission first!). Yes, bloggers are definitely some of the biggest offenders in this regard. Thanks for this post! Just stumbled upon it and know how you feel! We are in the same position and currently we are in the process of taking a big media entity in South Africa to court based exactly on this issue of infringement of copyright. The South African law is very vague on this issue and news reporting “entities” get away with it by throwing ” fair use” in our faces! LOL, At the moment there is a massive case pending between two big media players in our country which could change the law as it stands. We are thus adding to that with our case. Enough is enough and people/business just cannot continue to take credit for work they did not do! It is plain theft and unethical. 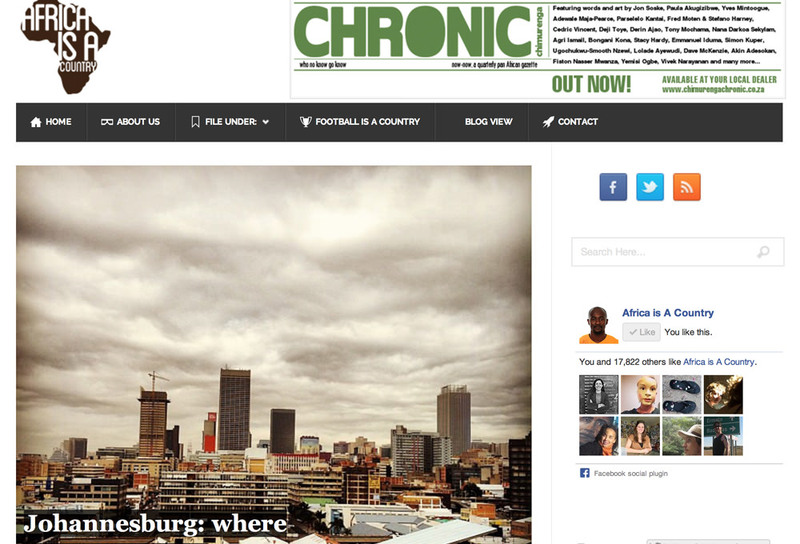 In South Africa, entities are playing the Global game but with local rules. This is going to change dramatically with the cases pending and our government is going to have a difficult task to ensure fair dealing with online content! The big players hide behind their team of lawyers so it is a case of David vs Goliath…In our opinion, more of us should voice these infringements and make it public! Unity is strength. Thanks for the informative comment, Rick. I really appreciate it. Good luck with your case.